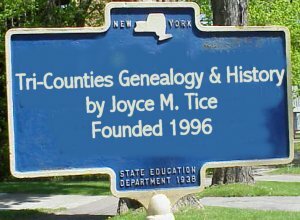 Census records are very often difficult to read because of handwriting, microfilm quality, and spelling issues. Our early census takers were not as well educated as we'd like them to have been, and even the people bearing the names often could not spell them with the same consistency we are accustomed to in our own time. The census taker wrote what he believed he heard as well as he could. Our volunteers have transcribed them for you to the very best or our abilities given the difficulties mentioned. Please be tolerant of what you would consider "mistakes." If you can recognize the names you are looking for, then it is a success. If not, then you may want to find a place where you can view the originals so that you can judge for yourselves. Excessive attention to outmoded spelling issues is the sign of a beginner in family research and will limit your research effectiveness. The 1855 census for Erin was collected by James Hollenbeck from June 4 thru June 29, 1855. I was able to copy the original records from microfilm to transcribe from. I looked in the 1850 & 1860 census for every family to compare to the 1855 census because of the bad handwriting. James Hollenbeck spelled the names just the way they sounded. For instance he spelled Hiram-Hyrum, Elizabeth-Elithabeth. His 4 & 7’s looked a lot alike. He spelled Orange Co as Oren throughout the census. I didn’t copy the names as he spelled them. He didn’t fill in a lot of the blanks. He only put down how many years the head of the household was in the county not the rest of the family. He only filled in child for the first child in column 9 for relationship. He left column 4 empty for households 83-87 & 90-96. If I found names in the other census records that matched up to the 1855, I put parenthesis around them. If I couldn’t find the family and had to guess at a name, I put a question mark after them. You can find the copies from the microfilm in the back of the notebook that I used. The notebook is located at the Steele Memorial Library in Elmira, NY. If you can correct any names feel free to correct them. The microfilm can be found at the LDS church in Horseheads or soon at the Steele Memorial Library.